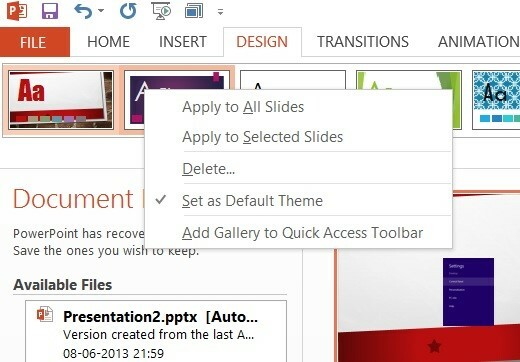 How to Change the Slide Size and Set as Default in Microsoft PowerPoint 2013? This article will explain how to change the slide size and set the new slide size as default in Microsoft PowerPoint 2013. In one of the previous blog post, we explained how to change the default slide size in Microsoft PowerPoint 2013. In this blog post, we will explore on how to change the slide size and set it as default in Microsoft PowerPoint 2013. 1. Just change the size of the slide to default size 4:3 as described here. 2. Save the Current them and Right on the current theme in the Design Tab and click “Set as Default Theme”. 3. Next time when you open the PowerPoint or create a new presentation file with the same theme, the standard size will be used.